Acute cholecystitis is an acute inflammation of the gall bladder most commonly due to obstruction of the cystic duct by gallstones. Less common causes are conditions that may lead to biliary stasis for example trauma, sepsis, total parenteral nutrition. the pain radiates to the back and the right shoulder. 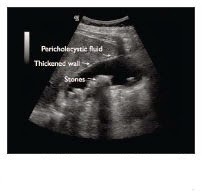 CT scan or MRi may show gall bladder thickening and pericholecystic fluid. Ultrasound is a quick diagnostic imaging that helps in detecting gall stones, sludge, gall bladder wall thickening and pericholecystic fluid. 1. Patients should be properly hydrated with IV fluids, given analgesics and should avoid taking anything by mouth following the diagnosis. .
2. Antibiotics ( e.g B lactums or cephalosporins ) are started to prevent the onset of worsening ductal infection. 3. open or laproscopic cholecytectomy is the definitive treatment.